In 2010, a street-level LRT alignment on Eglinton Avenue West from Keele Street to Jane Street was approved through a Transit Project Assessment study. A new study is now being undertaken to address concerns that were raised, specifically: traffic concerns at Black Creek Drive, pedestrian crossings at Weston Road, property impacts in the vicinity of Weston Road and a plan for a future Crosstown connection to GO Transit. Preliminary plans to retain the former Kodak Employees Building. The timing and construction method for Weston Road to Jane Street is to be determined through further study. The new study will assess the pros and cons of the design changes and identify measures to mitigate any impacts. The public is encouraged to review and comment on the study, including the future assessment of the proposed design changes. Protection for a future GO Transit to Crosstown LRT connection. The image below shows the proposed 2012 plan. The Vehicle Maintenance and Storage Facility must be on 17 hectares (42 acres) of flat property. The property must cause minimal displacement of existing commercial or industrial activities and should be ideally zoned for industrial, employment or transportation use. It should have close proximity to the future Eglinton line, ideally less than 1 kilometre away. The image below is a concept for the Vehicle Maintenance and Storage Facility. 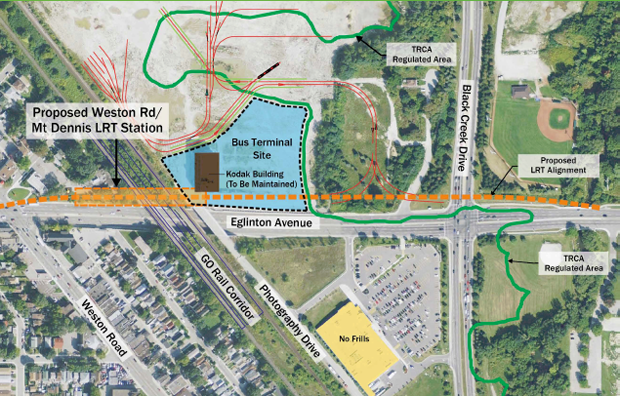 The Weston Rd/Mount Dennis LRT Station will be connected to a new 15-bay bus terminal. 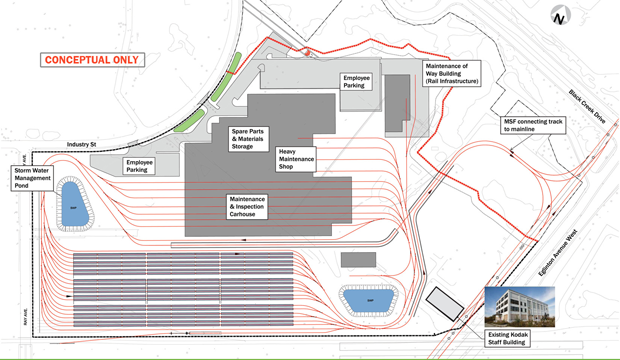 The image below displays a preliminary rendering of how the Station and Bus Terminal Site will be connected. At the east end of the future Weston Road/Mt. Dennis Station at Eglinton, pedestrians can enter at sidewalk level and go up to a pedestrian tunnel that connects to the bus terminal and then access the LRT platform from the east end of the station. From the west end, pedestrians will access the station by an entrance building at Weston Road street level and then descend down one level to the LRT platform. Access between The Crosstown LRT and GO Transit Trains will be determined through future study.